'Tis the season for colorful leaves, pumpkin picking, and fireside lounging. 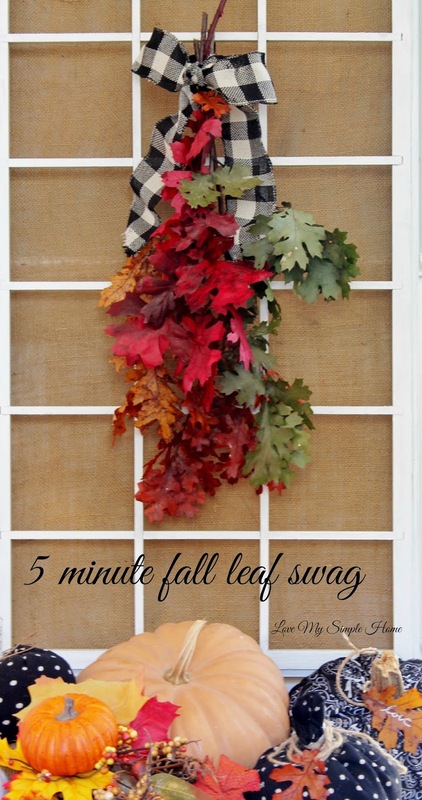 I've swapped out my summer wreath for this fall swag that took five minutes to make. I love a project that only takes a few minutes and this simple swag is one of those. Since this project only took five minutes to make, I had time to display a few pumpkins. I love the look of pumpkins when they are grouped together, don't you? Wow, this could be done last minute! Like on Thanksgiving Day! I like those kinds of projects! Thanks Naomi this would be perfect for last minute decorating to welcome Thanksgiving guest! Thank you for stopping.